These aprons are OK, a bit thin for me but are a great price so I wear 2 at the same time. I'm a chiropodist and these are great quality aprons at a great price. Quality of aprons better than some sourced from other providers - price isn't everything. 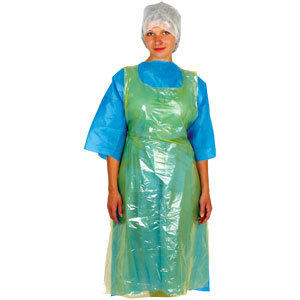 These aprons are strong and provide good coverage. product is not to thin like many other low priced products on the market. Fit very well and protect my cloths from spills etc.